In this in-depth analysis, Peter Muir argues that Gordon Matta-Clark’s Conical Intersect (1975) is emblematic of Henri Lefebvre’s understanding of art’s function in relation to urban space. By engaging with Lefebvre’s theory in conjunction with the perspectives of other writers, such as Michel de Certeau, Jacques Derrida, and George Bataille, the book elicits a story that presents the artwork’s significance, origins and legacies. Conical Intersect is a multi-media artwork, which involves the intersections of architecture, sculpture, film, and photography, as well as being a three-dimensional model that reflects aspects of urban, art, and architectural theory, along with a number of cultural and historiographic discourses which are still present and active. 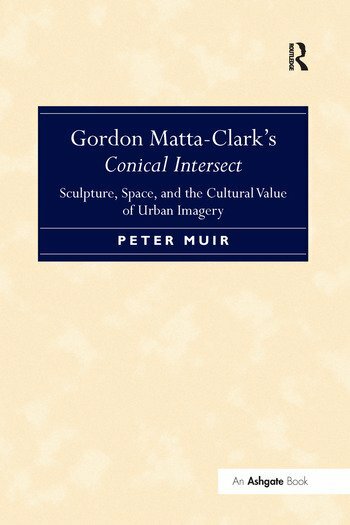 This book navigates these many complex narratives by using the central ’hole’ of Conical Intersect as its focal point: this apparently vacuous circle around which the events, documents, and other historical or theoretical references surrounding Matta-Clark’s project, are perpetually in circulation. Thus, Conical Intersect is imagined as an insatiable absence around which discourses continually form, dissipate and resolve. Muir argues that Conical Intersect is much more than an ’artistic hole.’ Due to its location at Plateau Beaubourg in Paris, it is simultaneously an object of art and an instrument of social critique. Dr. Peter Muir is a Research Associate with MIRIAD (the Manchester Institute for Research and Innovation in Art and Design) and an Associate Lecturer with the Open University, UK.